Love all the comments everybody! I have some good ideas now. I like the New American Commentary and Bible Speaks Today from my Ultimate package! I hope to get the WBC if it goes on sale, as $1499 is a hefty price. I wish that I got the NIVAC when it was on sale! Yes, I hope these great discounts for the WBC and NIVAC come up yet again to make the day for future users. But in the meantime, even with the NAC, PNT, NIGTC and Tyndale (+ the IVP dictionary series) --and much more!-- in your Ultimate collection, you've got enough 'oomph' for studying topics and verses quite well. Also Keep your eyes open for a sale of the jps publications as well, the torah set is well worth adding to your library (as is the Jewish study bible and jewish annotated nt, for the articles alone but the study notes are also good). Thanks Anthony and ukfraser! I appreciate all the advice! Also, the NICOT/NT is now on sale for $599. What are everyones thoughts on this?? Is this a CANT miss sale? Sweet!! Which ones do you personally like Dan? I appreciate your honest feedback Dan! Tony, what you said got me thinking, as usual! Disclaimer, i havent been to a seminary and dont really have access to academics i can ask so am reliant on libraries, dwindling book shops and forums like this. I was on retreat and had access to a library with a reasonable stack of commentaries. I had an assignment on ecclesiastes and found the wbc commentary useful. As the wbc set doesnt include 1 cor, i decided to get the nicnt in the current sale as have looked at them in the past. Having spent a bit more time with it now, what i think really draws me to wbc and nivac is the way they are structured rather than whether they are conservative or liberal. The contemporary application in the matthew volume doesnt resound with me as the examples are ones i dont really relate to( compared to the luke and john volumes) but i still find gems in the other sections. From the time i have spent with the nicnnt the commentary, it doesnt appear to be as structured. It will be interesting to see how i get on with it when living with it, but i certainly value the structure of the wbc. Hopefully that will be on a really good deal again some time in the future. And yes, as dr j says, it is important to have different resources, but after recently being at a challenging conference, it is also good to take stock of what it is that creates our personal comfort zone and it looks like structure is quite important to me! Edited by ukfraser, 11 February 2016 - 09:12 AM. It may just take some time to get use to! Or like you said it could be personal preference. I've heard a lot of good from all three that you mentioned WBC, NIVAC, NICOT/NT! 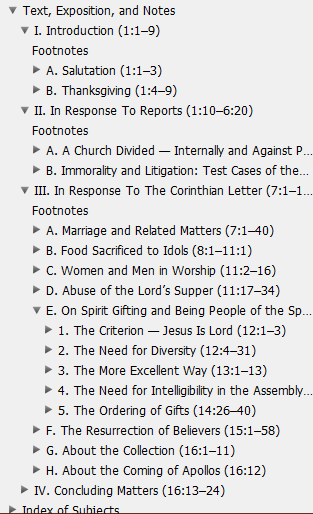 I was taking a look at the NICNT 1Corinthians index, and it seemed pretty well structured. Well, I did notice some possible sections to fix (which I highlighted in the partial screenshot), but it wasn't like the one I saw in your screenshot. It takes you to the commentary sections but they are not further broken down. (Screenshot below). In wbc each of these sections would be further broken down to translation, form and structure and comments etc so i dont have to read the author's explanation. 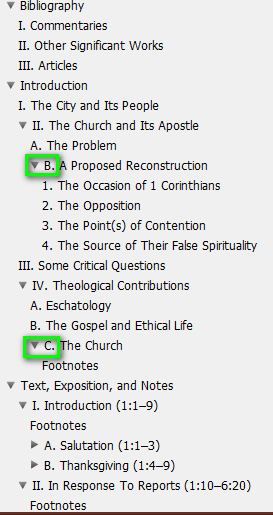 If you have the nicnt luke commmentary, it may be worth comparing how 4:1-13 is broken down. (Dan kindly sent me the text and it appears in one section and doesnt have the subdivisions that wbc and nivac do. It is translation followed by 'explanation'). This is very much personal preference, but this thread got me thinking about why i feel comfortable with the wbc. Screen shot of e on my ipad and each link takes you straight to commentary with no further divisions. Edited by ukfraser, 12 February 2016 - 06:24 AM. Oh, okay, I get it. Well, that would be something to consider adding in future editions, but at least that doesn't make the information any less valuable. The sale on NICOT/NICNT is amazing! Compared to how much this series usually costs here, other websites, or other software. Accordance has amazing sales, this one is really hard to pass up! Its made it to number 5 on the top sales list! Like all series NICOT/NT can be uneven, but it's often my starting point series. http://bestcommentaries.comis somewhat limited but I've found it a useful reference.